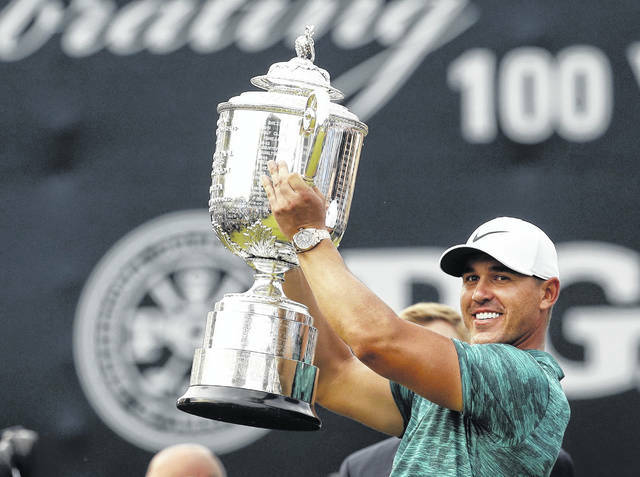 Brooks Koepka lifts the Wanamaker Trophy after winning the PGA Championship golf tournament at Bellerive Country Club, Sunday in St. Louis. It was his second major tournament victory this season. https://www.limaohio.com/wp-content/uploads/sites/54/2018/08/web1_Koepka.jpgBrooks Koepka lifts the Wanamaker Trophy after winning the PGA Championship golf tournament at Bellerive Country Club, Sunday in St. Louis. It was his second major tournament victory this season.